AB de Villiers and Moeen Ali hit impressive half centuries to guide Royal Challengers Bangalore to a respectable 171 for 7 against Mumbai Indians in their Indian Premier League game here Monday. However, veteran Sri Lankan pacer Lasith Maliga (4/31) pegged the visiting side back by removing Ali and Marcus Stonis (0) in the 18th over and taking two wickets in the final over. De Villiers was run out in the final over off a brilliant throw from long-on. Earlier put into bat, Behrendoff celebrated his World Cup selection by getting the prized wicket of Kohli, who edged to stumper Quinton De Kock. 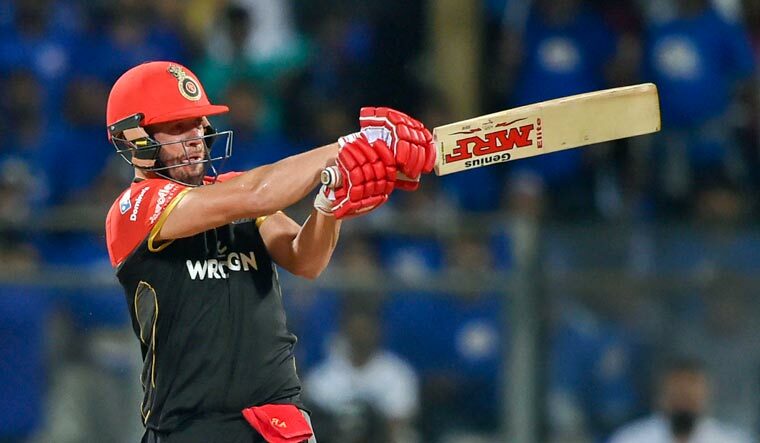 Parthiv struck three fours and a six off Behrendoff in the fifth over from which RCB amassed 19 runs. But he threw his wicket away, giving a dolly to Suryakumar Yadav off Hardik Pandya (1/21).